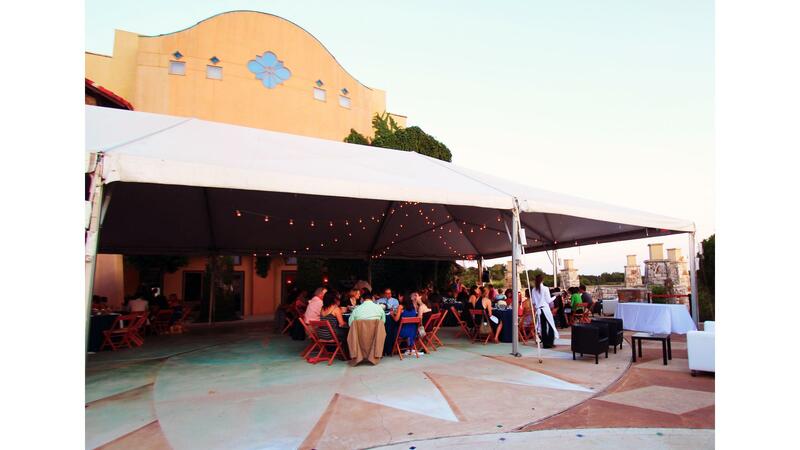 Rent One World Theatre | Corporate Events | Wedding Locations, Event Spaces and Party Venues. One World Theatre opened as an extension of the arts-in-education program with a mission to educate and inspire children and adults with innovative and exciting multicultural arts and entertainment programs. Your guests will appreciate the convenience of our location. Just 15 minutes away from downtown Austin, One World Theatre is easily accessible. Stunning architecture, artisan- crafted detailing, furnishings from all over the world, private rooftop and sunset decks, private dressing and dining suites, Romeo and Juliet balcony, Austin Hill Country views, gorgeous landscaping and a full TABC licensed bar service. Although we will make exceptions on the use of vendors outside our preferred list, we strongly suggest that our clients use our recommendations for their experience. 250 -	Seated in the outdoor Tented Grand Piazza. Tent walls can be closed with AC or heating added at an additional charge.